This peak is #72 in Prominence List for British Columbia .33km NE of Stewart. 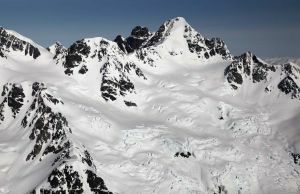 The highest peak in the massif formed by the Bowser River, American Creek, Bear River and the valley shared by Hanna and Tintina Creeks which connects Bowser and Meziadin Lakes and through which the Stewart-Cassiar Highway runs north to Telegraph Creek and beyond to the Yukon. Northwest of the American-Todd Creeks Pass, Jancowski is higher by two metres. CAJ 1986, page 82 "First Ascent of Mt. Pattullo" In early July, Alex Bertulis, Stimson Bullitt, and I returned. We made a short helicopter trip to the glacier on the west flank of the summit (the Bowser Lake drainage) then donned crampons for a truly rewarding glacier climb to the 8955 ft summit. We chose a route that involved a steep gully then a spectacular summit ridge. A trace of new snow made the surface very white and glisten ing. We descended by the south ridge. Our route back to the mining road south-east of the mountain involved a long glacier traverse after crossing an ice pass, then a descent of a valley glacier. We were impressed with the spectacular nature of this little visited region. Mt Pattullo alone has some 26 glaciers and on nearby peaks are a number of impressive bodies of ice, including the Frank Mackie, Berendon, and Salmon Glaciers, and the Cambria Icefield. Name Notes: Duff Pattullo was BC's Premier from 1933 to 1941, when he resigned having nearly lost an election to the CCF (the predecessors to the NDP), who won a plurality but not enough seats to form a government. John Hart took over the Premiership after forging an alliance of Liberal and Conservative Parties in order to keep the socialistic CCF from power.